Readers share the suburban bounty of wild, healthy, and delicious edibles discovered by a newbie foraging couple. Wendy and Eric Brown, in their quest for a more self-sufficient lifestyle, decided to spend a year incorporating foraged food into their diet. Browsing Nature’s Aisles tells the story of why and how they lived off the land, and how the experience helped them become more in touch with nature and all it has to offer. The couple’s adventures in foraging show that much of the their knowledge about the subject came by “simple observation followed by a flurry of research,” which uncovered the bounty, but also the numerous complexities, in nature’s offerings. For example, while nettle leaves could be used as a salad-type dish, once they are dried or dehydrated, they can also be used to make tea or added as vitamin boosts to soups or stews. The diversity of wild edibles includes foods derived from hunting and gathering, such as bow-hunting the flock of turkeys that landed on their property, or clamming on the tidal flats. 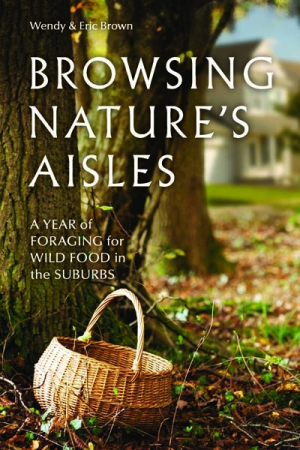 Browsing Nature’s Aisles offers inspiration, passion, and a solid introduction to foraging in the suburbs.